I did it! Mom’s scarf was completed Friday night. And I love it. The yarn is such a dream to work with. I highly recommend it. Pattern: Feather and Fan. I used Jo Sharp’s pattern from Scarf Style, but really it’s just a Feather and Fan. The book did give me the inspiration (after trying out at least 10 different stitch patterns) so it certainly deserves the mention. I broke my yarn diet yesterday and bought a hank of Manos. And get this – I’m not using it for the intended purpose. Oh well. Manos is gorgeous and I’ll find a good use for it. 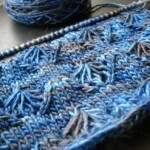 I told myself it was OK since it was for use with a stash yarn that needed the Manos as an accompaniment. But after swatching it was no go and so it goes back into the stash. Bah! Your mom looks great in the scarf you made her… and, WOW! she does NOT look like she could be your mom. She looks young enough to be your sister. Lucky you, it looks like you’ll never look any older. Beautiful scarf – the color are fantastic! Isn’t that book wonderful – I have sevarl projects from it in the palnning stages. Love the colors are her. Very nice gift! The scarf looks great! And I see you have a few other FO’s finished over the weekend! Congrats! Wow! What a pretty scarf! Drape is something that is very important in a scarf, well heck, its important for everything! great! That was a good reading and informative. You obviously know your stuff! My bro am impressed by the effort that went into your writing and the way you managed to keep the flow from Introduction of the topic to the summary. Do you think you might cover recent developments in all or what are your thoughts about that.